What are the top posts and topics on Facebook at this moment? This and a lot more exciting information is given to you in the new Fanpage Karma LIVE. All in all it will help you to stay up to date about new developments, to know what posts and issues are going through the roof or which ones are flopping right now. Because if you are aware of what’s happening while it’s happening you can react quickly and benefit of such momentum. 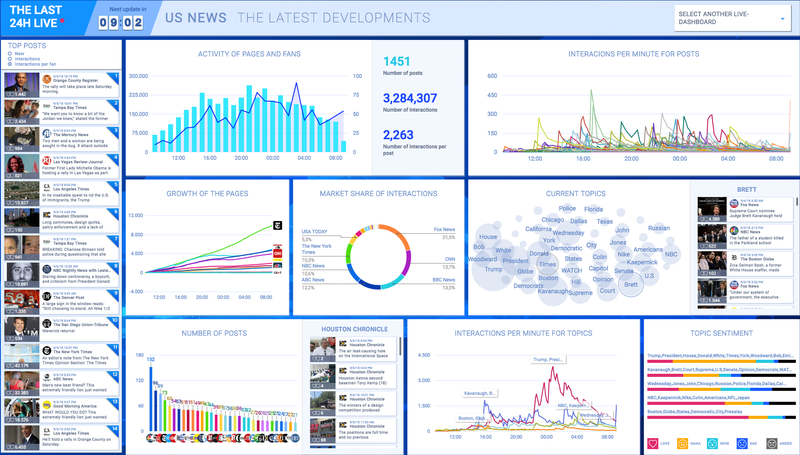 The new LIVE shows you all the news about the Facebook Pages of chosen dashboards. It is cut out specifically to certain areas of interest or branches. We prepared some exemplary boards for you to give you an idea of what you can get out of it. It will get really interesting, of course, when you make your own collection of pages. If you are in banking, for example, you might create a dashboard of pages of competing banks as well as the pages of your own to observe what they are conversing about and how the communities are reacting. We decided to present the new LIVE fullscreen (1920 x 1080). That way you have all the information at one glance, no scrolling necessary. Separate graphics show what happened on the pages of a chosen dashboard in the last 24 hours. A list of the top posts of all pages sorted by actuality, interactions or interactions per fan. A graph that tells you the overall activity of the Facebook Pages. How many posts were posted when and how many reactions were made by the fans (total and per post). Here you get to know how many interactions were made per minute per on the different posts. And therefore at what times the community is most active. Which pages gained the most fans over the past 24 hours? Out of all the interactions that were made, what page got what percentage? 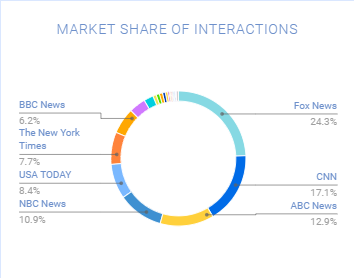 This graphic indicates the hottest topics and their connections. Clicking on a topic opens up the complete list of posts relevant to it. Who published the most posts and what were they? You will get a ranking of all Facebook Pages and each of their complete post lists. What are the most emotional topics? The curves of this graph show how many interactions were made per minute on which topic. We love this! 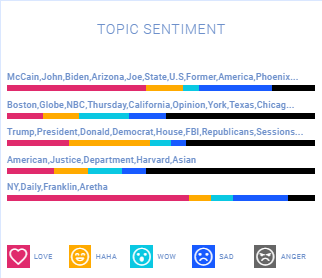 This graphic visualizes the top topics and their dominant reactions. Which one is making the Users sad, which is creating anger? It gives valuable information for your decision on what topis to pick up on. 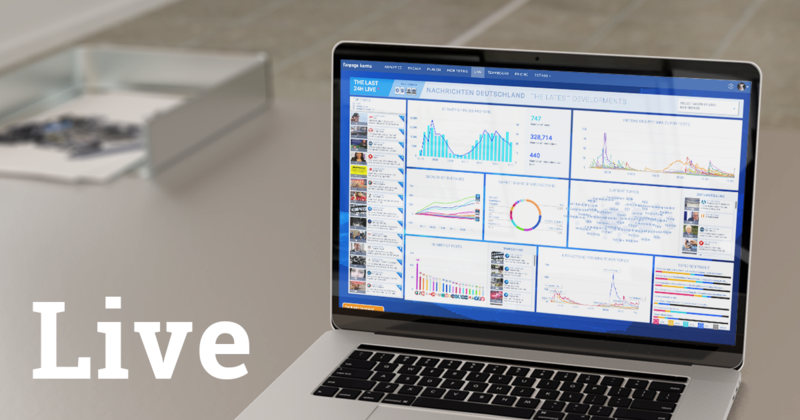 Do you have a collection of Facebook Pages that you want to observe LIVE? Let us know! Check out the new LIVE here.